Dr. Nikola Tesla was a witness to both the World Wars and also to the many uprisings and revolts that happened across the globe during his times. With his natural instincts and his nature, he cared for all the people and strongly advocated independence; independence of not just nations but of individuals in their own lives and of their individuality. He always dreamt of the world where even a common man would be free from all sorts of bondages, slavery and dependencies. 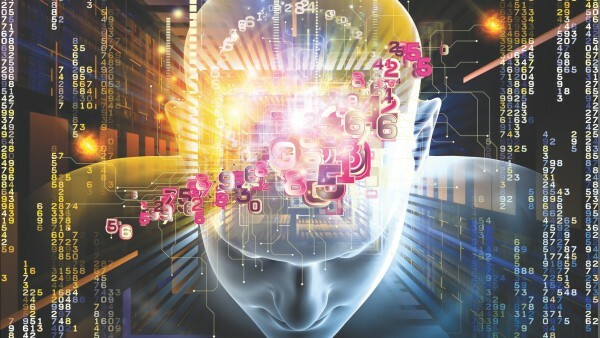 This was his very basic instinct behind developing the humanoid robots about which we have already discussed. With a natural pull towards freedom and peace, it was obvious for Dr. Nikola Tesla to think of ways and means in which he could end the actual war. And it was before and during both the World Wars that Dr. Tesla made efforts in this direction. The World War – I made Dr. Tesla deeply worried about the scores of lives lost and the length of the conflict. During this war, Dr. Tesla was well aware of the menace that the German U-boats (early forms of submarines) were inflicting across the Atlantic, endangering thousands of lives, even of the innocent civilians. Hence with intent to stop these marauding machines Dr. Tesla proposed the building of radars capable of detecting the U-boats to the US Navy. But we are aware of this proposal of Dr. Tesla being turned down by the US Navy under the leadership of Thomas Edison who was jealous of Dr. Tesla. The radars proposed by Dr. Nikola Tesla were based on the projection of electrical rays. Dr. Tesla’s work on particle beam weapons can be traced all the way back to 1892 with his invention of a carbon button lamp, and experiments on X-rays. Dr. Tesla was also involved in experiments with shooting cathode rays at targets. Dr. Nikola Tesla not only invented the ruby laser in 1893, but he also demonstrated it and published its results. Further, in the year 1918, Dr. Tesla apparently built a laser-like apparatus. It is also argued that with this apparatus Dr. Tesla had shot laser ray (Ruby Ray) that reached all the way up to the moon at 384,400 kilometers. 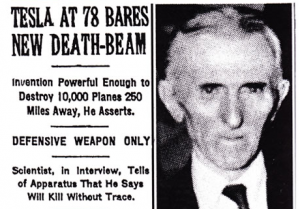 Dr. Nikola Tesla worked extensively on directed energy science and the finest product that came out was the ‘Peace Ray’, often wrongly dubbed by media as ‘Death Ray’. but Dr. Tesla called it ‘Teleforce’, which was a charged particle beam projector that Dr. Tesla claimed to have conceived of after studying Van de Graaff generator. Dr. Tesla described the weapon as being able to be used against ground-based infantry or anti-aircraft purposes. It found public mention in The New York Times and New York Sun and on July 11, 1934. The nozzle of this apparatus of Dr. Tesla would send concentrated beams of particles of such tremendous energy through the free air that they could bring down a fleet of 10,000 enemy airplanes at a distance of 200 miles from a defending nation’s border and cause armies to drop dead in their tracks. This Particle Beam Weapon used a high-energy beam of atomic or subatomic particles to damage targets by disrupting their atomic and molecular structure. Hence the Peace Ray, part of the Tesla Shield provided protection even against the nuclear weapons. Even gamma radiations and EMP (Electromagnetic Pulse) from high-altitude nuclear explosion above Tesla Shield couldn’t penetrate it due to repetitive absorption and reradiation, and scattering in layered plasmas. CRTs in televisions and computers are the simplest and the most common examples of particle accelerators known to us. Dr. Tesla’s records further indicate that the device is based on a narrow stream of small tungsten pellets that are accelerated via high-voltage. The pellets would travel at 48 times the speed of sound. When put in operation Dr. Nikola Tesla said this invention of his would make war impossible. The Ray would surround country like an invisible ‘Great Wall of China’ and make it million times more impenetrable against attacks by airplanes or large invading armies. Dr. Tesla’s Ray, by its nature, could not be employed as a weapon for the offense. The Ray could be generated only from large, stationary and immovable power plants, stationed in the manner of old-time forts at various strategic distances from country’s border. They couldn’t be moved for purposes of attack. An exception, however, made in the case of battleships, which would be able to equip themselves with smaller plants for generating the Ray, with enough power to destroy any airplane approaching for attack from the air. Tremendous speed of particles would give them destruction-dealing qualities. Even the thickest of the armoured surfaces confronting them would be melted in an instant by heat generated in the concussion. The Ray required a large plant to be generated but once it was established it would be possible to destroy anything, men or machines, approaching within a radius of 200 miles. Dr. Nikola Tesla claimed that the deterrence that would be created with the incorporation of this weapon would make war impossible. Dr. Tesla made his offer of Peace Ray to the United States, United Kingdom, France, Canada, Russia, and Yugoslavia. Yet it was rejected by all the nations. Dr. Tesla was sure that Peace Ray was the weapon that would make warring nations to agree at once to establish lasting peace and put an end to the on-going World War II and save lives. What relevance does Peace Ray of Dr. Nikola Tesla hold in today’s times? As of today, there are nine countries across the worlds that possess nuclear weapons. Apart from these the, we are not sure as to how many of the other countries have nukes in the light of nuclear proliferation scandals. The world is witnessing a state of constant war and conflict in over 64 nations across the globe which are certainly pointing towards commencement of a long drawn and a bloody World War. Moreover, there is a constant fear of the nuclear weapons of the world falling into the hands of extremists and terrorists, who mindless of its aftereffects could use it against the civilian population. But in the wake of these catastrophic threats the Peace Ray that we have been talking about is ‘the only respite from nuclear war’ and indeed ‘the weapon to end the war’.